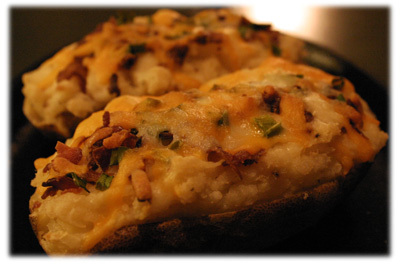 This twice baked potato recipe is one of those side dishes that come out looking like they were way harder to make than they actually are. 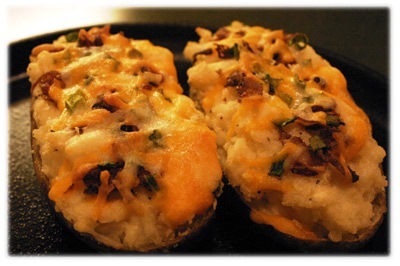 If you've had so called twice baked potatoes and you're now looking for the ultimate recipe then I think you'll be impressed with the ingredients in this one. The flavors almost melt into each other. What I like the most is they're a great make-ahead side dish and refrigerate well until you want to give them the second bake, just before serving. The real secret that makes this grilled potato recipe different from all the rest is the real roasted garlic and creamy goat cheese you mash into the potato after the first baking. And here's the easy part - the garlic is roasted right along side the potato in your BBQ or oven so it's no extra work. Load them up with crumbled bacon, chopped green onion and the shredded cheese of your choice. If you want, keep them refrigerated until you need them. 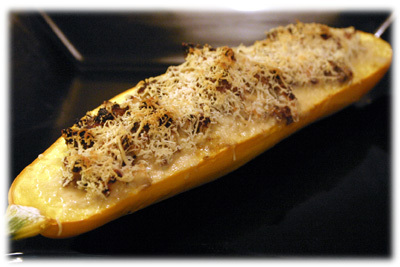 The 2nd bake is only 20 minutes and that heats up the potato again and melts the cheese. 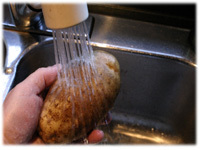 Rinse each potato well under running water. 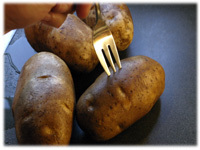 Pierce each potato once with a fork to allow some steam to escape and prevent the skins from splitting open. 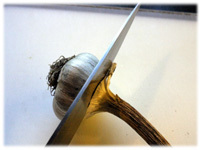 Keep the head of garlic intact (don't remove the skin or covering) and cut the top of the head off so each clove is exposed. 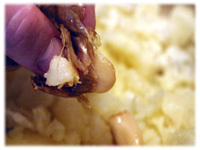 Place the head of garlic in a piece of tin-foil (form into a pouch to hold it upright) and pour about a tablespoon of oil over the head so it runs down into into the cloves. 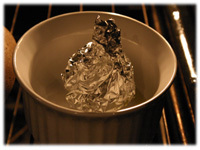 Wrap it tightly in the tin foil to prevent any of the oil from leaking out. Preheat the BBQ or oven to 350F - 375F for indirect cooking. When the cooking temperature is reached place the potatoes, uncovered, in the BBQ or oven directly on the grate. 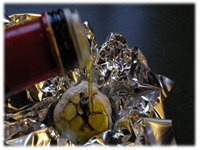 Place the tin foil wrapped garlic head in a small oven-proof dish and place in the oven beside the potatoes. Check a potato after 60 minutes. When you squeeze it gently it should feel spongy - if not leave them another 15 - 20 minutes to be sure. Remove the garlic after 60 minutes and let sit wrapped in it's tin foil until ready to use. Remove the potatoes from the BBQ or oven and evenly slice them in half length-wise. 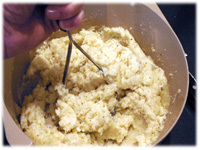 Very carefully scoop out the cooked potato flesh with a tablespoon into a large mixing bowl. They will be hot, you may want to wear an oven mitt on the hand you hold the potato in. 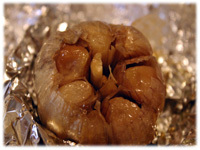 Remove the foil from the head of roasted garlic. It should be golden brown and the cloves should be very soft to the touch. 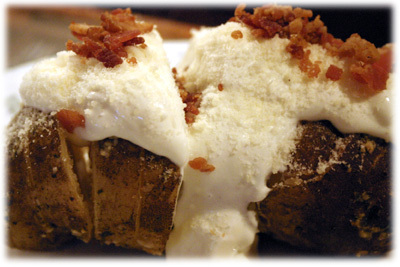 Gently begin squeezing the cloves one by one out of the head into the bowl of baked potato. Combine the goat cheese, melted butter, chicken broth, onion powder and salt and pepper to the potato mixture and mash well. 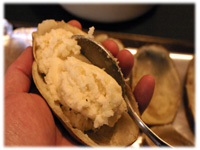 Lightly spoon the mashed potato mixture into each hollowed out potato skin. Tip: don't over pack the mixture into the skins, you want the potatoes to be light and fluffy for eating. If you've extra mashed potato mixture add it to the tops of each potato but don't pack it down too tightly. 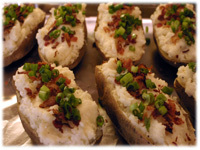 Sprinkle the crisp cooked crumbled bacon and chopped green onion over each potato. Sprinkle the shredded cheese over each potato. When ready for the second bake, preheat BBQ or oven for indirect heat at 300F. 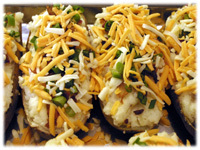 Place each twice baked potato in the BBQ or oven for about 20 minutes until the cheese is melted and the filling is hot.